How to exercise your dog in cold weather? The winter is coming , and the weather is becoming colder and colder. Ensuring that your dogs get enough exercise throughout the year is crucial to their health. Here we present seven useful tips to make sure that you are giving your dog enough exercise throughout the winter. Your pup’s exercise requirements will differ by age, size, breed and diet, but most veterinarians will agree that a dog needs daily exercise, broken up into two or three sessions, totaling no less than 45 minutes a day. An exercise session can be anything from a brisk walk to a game of catch or a hard run but it should try to incorporate both physical and mental stimulation, as well as a bathroom break. Put yourself in your dog’s winter booties. If you had a thick layer of fur, you wouldn’t mind spending an extra ten minutes rolling in the snow. Always dress to be as warm as your pooch and keep moving along with them. In this way you will both be at a similar temperature and you will be more likely to want to go in at the same time. Choosing the right clothing and gear is important for both you and your dog. Avoid slipping on ice with a good pair of winter boots, and get a matching pair of booties for your dog to help keep their paws safe and comfy. Likewise, having some unique winter toys on hand can increase the fun factor. Imagine playing fetch with a heavy ball in the snow – one throw and it’s game over. Choose a bright colored or glow-in-the-dark Frisbee that won’t sink into snow. Exercise is as crucial for your health as it is for your dogs. Don’t come home from the gym dreading your evening dog walk. Instead develop a manageable winter workout to do with your dog. Snowshoeing and cross-country skiing are great exercises you can share with your dog, but snowball fights and sledding are also healthy pursuits your dog and family will love to get together for. You have probably heard of dog sledding but have you ever heard of skijoring? 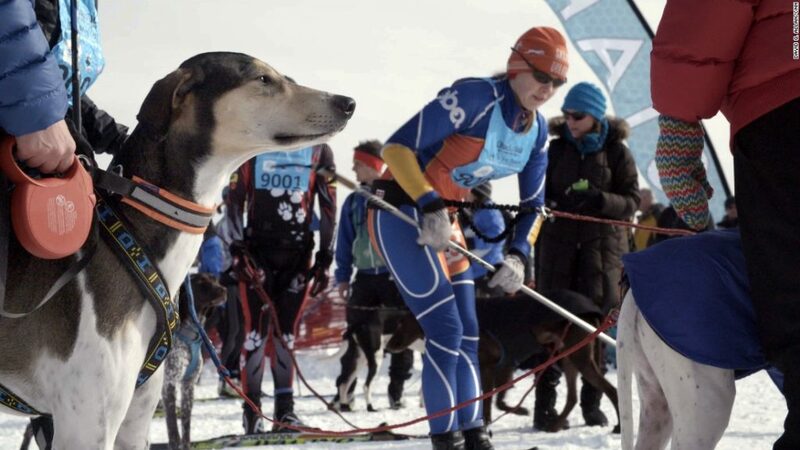 Skijoring is a variation on dog-sledding where all your dog has to pull is you, on skis. Dog sledding can be a fun and humane sport if you know what you’re doing but skijoring requires much less equipment and a lighter load which means it can be more suitable for someone who is running only one or two dogs. As with all dog-pulling activities you have to have the right leash to avoid straining your pooch. New studies in canine medicine suggest dogs are as susceptible to Seasonal Affective Disorder (SAD) as humans. The best way to fight winter blues is with lots of exercise and a healthy diet, rich in vitamins, particularly vitamin D. If your dog doesn’t feel like going out even when you snap on the leash and start shaking the treats bag it may mean they are suffering from SAD and they could benefit from a multi-vitamin and the use of a sun lamp for a few mid-day hours. If all else fails and you must stay in, don’t let that be an excuse not to show your dog love and attention with active indoor games. Race up and down the stairs, try some tug of war, or practice some Dog Yoga. There are so many great ways to interact with your dog. The cold days will come but, for your dog’s health and yours, try to stay active and keep having fun. Every season is beautiful in its own special way. The burst of flowers in spring, memories of the beach during summer, the colors of fall, and now, as winter arrives, we await the snow dusted pine trees of a frosty morning. Our dogs love every season as well, racing through flowers, leaves or snow with equal vigor.